Description: MRL's daily ML manifest is about to crest the top of Mullan Pass, eastbound at Blossburg, Montana. Description: Missoula-Laurel "ML" just out of Missoula crossing Blackfoot River. 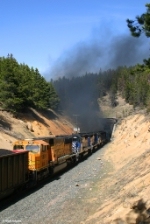 Description: In an unusual role reversal, grain train power is added to assist Laurel-Missoula across the Continental Divide. Description: Missoula-Laurel is running up to Blossburg in notch 8 with no helpers in sight. Description: Nice varied EMD set here, crossing Little Blackfoot River. Description: Laurel-Missoula is approaching Little Blackfoot River. Description: There's quite a bit of history in Laurel-Missoula "LM"'s consist today. Description: Laurel-Missoula on Bozeman Pass. 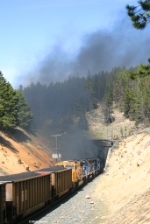 Description: It's a long, sharp drop down from here as Laurel-Missoula exits Bozeman Tunnel. Helpers cut off on the other side & drift back to Livingston. Description: HELPER4 in the foreground, with the head-end power above it. Yes, the lead motors ARE climbing that steep! Description: HELPER4 returns downgrade near Austin. Description: When the sound of the ML was really getting loud, I knew that it wasn't just a pair of ACe's on the point, and we were rewarded with this incredible lashup. Description: Thanks to the snow drift that was still sitting on top of the hill mocking us, we chose to stay put, rather than attempt to follow the ML down to Helena, where he would meet a loaded coal train. Description: A 5-pack of SD45s is good, anywhere in the train!! Description: MRL helper set with sequential numbers returning to Livingston after helping another train over Bozeman Pass.